Knowing the general trend of your blood pressure can play a role in assessing your overall health and risk for disease. Thankfully, checking blood pressure at home is quite easy. Your blood pressure reading essentially tells you how hard your heart is working to move oxygenated blood through your arteries and to your organs. It’s measured using two readings: systolic pressure and diastolic pressure. Systolic blood pressure is the measurement of pressure inside an artery when the heart contracts to pump blood. Diastolic pressure measures the resting pressure of blood inside the artery between beats. These are written down as a ratio of the systolic reading over the diastolic reading in millimeters of mercury (mmHg). An example might look like this: 120/80 mmHg. The higher those numbers are, the harder your heart is working. The benefits of checking blood pressure at home could be lifesaving. Regularly monitoring your blood pressure at home can lead to significantly lower blood pressure over the course of a year when compared to clinician measurements. This can help reduce the risk of high blood pressure and its associated dangers. Although high blood pressure is known as the “silent killer,” it is largely preventable with lifestyle interventions. A daily reminder of your blood pressure can provide added motivation to keep your numbers manageable. First, it can serve as positive reinforcement: seeing the numbers go down makes you feel great. Second, it provides valuable feedback on your overall health, and if the numbers are excessively high, it can ensure you get to the hospital if needed. Physicians predict that regular, accurate home monitoring could reduce your stroke risk by 20% while lowering your coronary heart disease risk by 10%. If you have high blood pressure (also called hypertension) or are at risk of developing it, it’s highly recommended to start monitoring it daily at home. 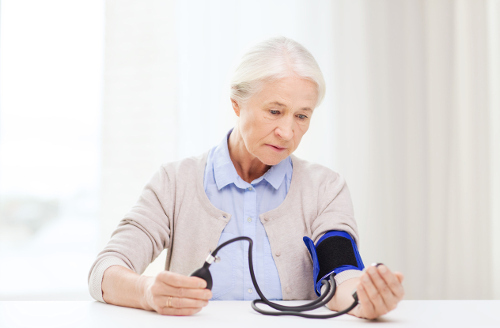 One of the biggest benefits of measuring your blood pressure at home is avoiding “white coat syndrome.” Put simply, white coat syndrome is a case of nerves that arises when a doctor or nurse checks your blood pressure. It’s a temporary spike that doesn’t give an accurate portrayal of your blood pressure, which can change by the minute. Estimates suggest that up to 20% of people diagnosed with hypertension actually have white coat hypertension. Because you can’t feel your blood pressure, tracking it at home lets you know where it’s at and where it’s going. Daily monitoring can show you the bigger picture, and whether or not your lifestyle interventions or medications are having the desired effect. There is also research indicating that people who check their blood pressure at home and mail the results to a pharmacist are far more likely to keep it in check than those who don’t. One of the easiest, fastest, and most accurate ways to check your blood pressure at home is with an automated blood pressure machine. These machines have automated cuffs that you wrap around your arm. All you have to do next is push a button and the cuff fills with air and shows your blood pressure on a digital screen. They can be purchased at virtually any pharmacy or health food store and at most grocery stores. Choosing the right blood pressure monitor is important for getting accurate readings. The best monitors have the inflatable cuff that goes over the bicep. Other varieties use the wrist or finger and simply won’t be as reliable. Before buying, measure the circumference of your arm and make sure the size falls within the range of the monitor. If it’s too big or too small, the readings will be off, thereby sabotaging your efforts. To check your blood pressure, sit up straight in a chair with both feet flat on the floor. Sit for a few minutes before taking the reading, because you want a resting heart rate. If you just ran up the stairs, it won’t be accurate. Also, don’t talk during the reading—do it somewhere quiet. Rest your arm on a surface like a desk or table so it’s at the level of your chest. Follow the instructions on the machine to take the reading. Sit still during the reading, then wait a minute or two before taking your pressure another one or two times. Take the average of the two or three readings to establish your blood pressure. Keep a log of your readings to assess any progress. If you’re wondering how to check blood pressure manually, it’s a little more difficult than you might think. You’ll need a partner and some equipment, and it also won’t be the most accurate reading. The cost of an at-home automated monitor is well worth the investment. That said, it’s possible to check your heart rate without one. You can check your heart rate by feeling your pulse and counting how many times your heart beats over the course of a minute. To do this, feel for the artery just below the thumb at the inside of your wrist. Once it’s located, place two fingers there and see how many pulses you feel over the course of 15 seconds. Multiply that number by four to learn your heart rate. It should be noted that your heart rate is not your blood pressure—taking blood pressure with fingers is impossible—but having between 60 and 100 beats per minute would be considered “normal.” But if you’re wondering how to check your blood pressure by hand, you likely won’t be able to. Don’t smoke or drink coffee for 30 minutes prior to a reading. Go to the bathroom prior to the test. Relax for five minutes before the measurement. Sit in the chair where you’re taking it so you don’t have to move. Sit on a chair with a firm back and with your feet flat on the floor. Place your arm on a solid, flat surface (like a desk or chair) at chest level. Place the middle of the cuff directly above the bend of your elbow. Take multiple readings (up to three) one minute apart and take the average. Take your readings at the same time every day, or as instructed by your healthcare provider. Record the reading, along with the date and time, in a journal. If you have several high readings, call your doctor. A single high reading is unlikely anything to worry about, but a number of them on consecutive days or during a single measurement period could indicate an emergency. If the reading reaches a systolic blood pressure of 180 or higher or diastolic pressure of 110 or higher, call your local emergency responders. Measuring twice per day: Do it in the morning before eating or taking any medications, and then again in the evening. These are the probably the best times to check blood pressure because they become routine. Not measuring immediately upon waking: Try getting breakfast started and brushing your teeth first. Just don’t eat, drink coffee, smoke, or take medication before the reading. Measuring bare arms: Place the cuff on your bare skin, not over your sleeves. Monitoring your blood pressure at home with daily readings is a great way to stay on top of your health and track your progress. An automated at-home monitor provides the most accurate readings and is highly recommended for anyone concerned with their blood pressure, heart health, and overall well-being. “Home-based blood pressure monitoring should be commonplace in NHS, say researchers” University of Birmingham, February 27, 2018; https://www.birmingham.ac.uk/news/latest/2018/02/blood-pressure-birmingham-university-research.aspx, last accessed July 24, 2018. “Checking blood pressure: Do try this at home” Harvard Health Blog, April 30, 2018; https://www.health.harvard.edu/heart-health/checking-blood-pressure-at-home, last accessed July 24, 2018. Jin, J., “Checking Blood Pressure At Home,” JAMA, July 2017, 318(3):310; https://jamanetwork.com/journals/jama/fullarticle/2643764, last accessed July 24, 2018. “Vital Signs (Body Temperature, Pulse Rate, Respiration Rate, Blood Pressure)” John Hopkins Medicine, 2018; https://www.hopkinsmedicine.org/healthlibrary/conditions/cardiovascular_diseases/vital_signs_body_temperature_pulse_rate_respiration_rate_blood_pressure_85,P00866, last accessed July 24, 2018. “Get The Most out Of Home Blood Pressure Monitoring,” Mayo Clinic, March 7, 2018; https://www.mayoclinic.org/diseases-conditions/high-blood-pressure/in-depth/high-blood-pressure/art-20047889, last accessed July 24, 2018.